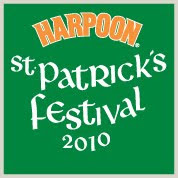 What is Harpoon St. Patrick's Festival all about? Kick off the St. Patrick's Day Holiday season in Harpoon style! What better place to begin the season than inside the largest brewery in Boston?!?!?! Come dance the jig, enjoy Harpoon beer, and celebrate St. Patrick! Usually the first weekend in March. * At the Harpoon Brewery, 306 Northern Ave., Downtown Boston. * Free shuttles from the South Station area. Departs from behind the Federal Reserve along the Fort Point Channel off Summer Street. Look for the Shuttle Sign. * Take the "T" to the event aboard the new Silverline Bus. Visit http://www.mbta.com for schedules, rates and bus routes.Take SL2 or SL3 and get off at Harbor Street. * Click Here for Map/Directions.